View of Mount Agung on Nov. 10, 2017, from the Rendang Volcano Observatory, operated by CVGHM. Credit: Jake Lowenstern, US Geological Survey. A team of scientists, led by the University of Bristol, has used satellite technology provided by the European Space Agency (ESA) to uncover why the Agung volcano in Bali erupted in November 2017 after 50 years of dormancy. Their findings, published today in the journal Nature Communications, could have important implications for forecasting future eruptions in the area. Two months prior to the eruption, there was a sudden increase in the number of small earthquakes occurring around the volcano, triggering the evacuation of 100,000 people. The previous eruption of Agung in 1963 killed nearly 2,000 people and was followed by a small eruption at its neighboring volcano, Batur. Because this past event was among the deadliest volcanic eruptions of the 20th Century, a great effort was deployed by the scientific community to monitor and understand the re-awakening of Agung. During this time, a team of scientists from the University of Bristol's School of Earth Sciences, led by Dr. Juliet Biggs used Sentinel-1 satellite imagery provided by the ESA to monitor the ground deformation at Agung. Dr. Biggs said: "From remote sensing, we are able to map out any ground motion, which may be an indicator that fresh magma is moving beneath the volcano." 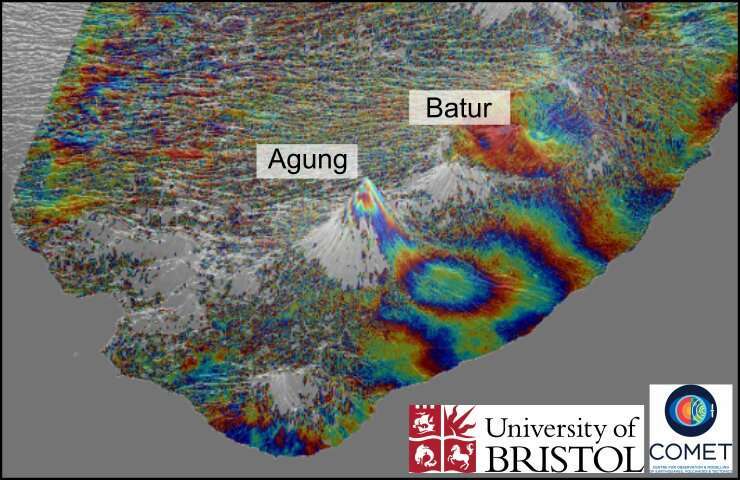 In the new study, carried out in collaboration with the Center for Volcanology and Geological Hazard Mitigation in Indonesia (CVGHM), the team detected uplift of about 8-10 cm on the northern flank of the volcano during the period of intense earthquake activity. Dr. Fabien Albino, also from Bristol's School of Earth Sciences, added: "Surprisingly, we noticed that both the earthquake activity and the ground deformation signal were located five kilometres away from the summit, which means that magma must be moving sideways as well as vertically upwards. 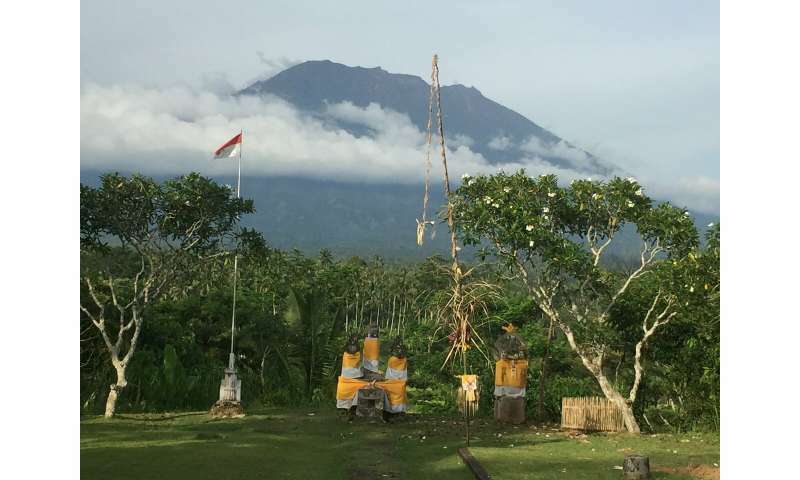 "Our study provides the first geophysical evidence that Agung and Batur volcanoes may have a connected plumbing system. "This has important implications for eruption forecasting and could explain the occurrence of simultaneous eruptions such as in 1963."